Filter Designer is an add-on tool for WIPL-D Microwave. It features a user-friendly interface and it is intended for automated design of lowpass, highpass, bandpass and bandstop filters of Chebyshev and Butterworth type. Filter Designer enables fast and accurate design, for the desired specification, in a simple and straightforward manner. At every design step, the user can adjust design parameters and instantly see the updated magnitude response plot. This serves as a validation mechanism and quantitative feedback, which greatly minimizes errors and speeds-up the overall design. Filter Designer generates a parameterized schematic suitable for analysis and optimization in the WIPL-D environment, allowing full 3D EM characterization of the filter components. Filter Designer creates the best possible initial design suitable for implementation, which is based on a suite of the WIPL-D custom filter synthesis procedures. Currently supported implementations are microstrip, ideal transmission line, and lumped LC ladder. Practical design topologies include stepped-impedance, shunt stub, and capacitively-coupled resonator filters. Different port impedances, that is different load and source resistances, are inherently supported. LC implementation is commonly used in applications where small size is required, especially at lower frequencies where transmission line devices might be excessively large. The microstrip implementation technology is widely used because of its plain fabrication. 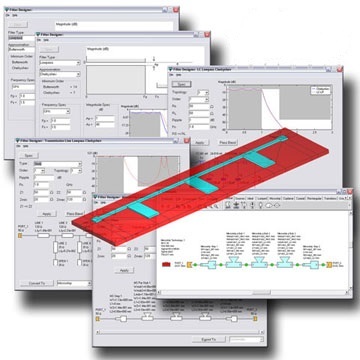 Because of its user-friendly interface, synthesis accuracy, design efficiency, and great flexibility, Filter Designer is an indispensable assistant for RF/microwave engineers and practitioners.